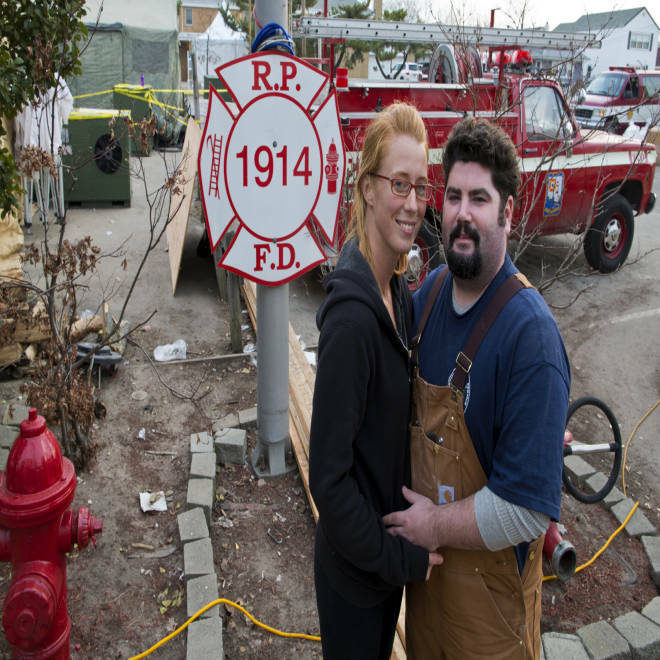 James Keane, a volunteer with the Rockaway Point F.D and a full-time dispatcher for the FDNY, and his fiancee Kristen Diffendale on Sunday in Breezy Point. BREEZY POINT, N.Y. -- The wedding had been two years in the making: The church was booked, the custom fuchsia and blue Converse sneakers for the bridesmaids were ordered, and the firehouse was secured as a staging ground for the groomsmen. 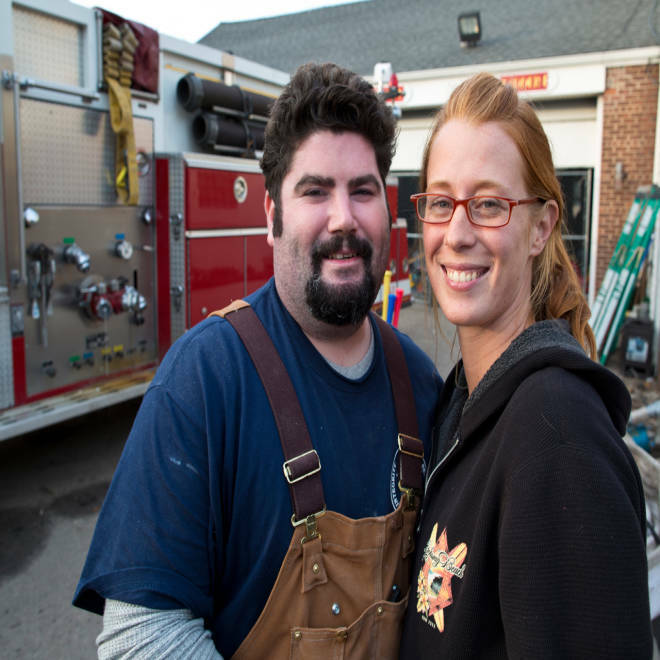 But then Superstorm Sandy struck, flooding the firehouse, forcing the church to turn into a command center, and scattering the guests and the newlyweds-to-be, as well as the custom Converse, less than a month before the big day: Friday, Nov. 23. Now, with much of their Breezy Point community in ruins, Kristen Diffendale, 29, and James Keane, 28, are turning their wedding into a celebration of what the storm couldn’t take away. As Sandy swept through the seaside community of Breezy Point on Oct. 29, Diffendale hunkered down at the home she shares with her future in-laws and her three-year-old daughter, Madison Shea. Keane, her fiancé and Madison’s dad, was in Brooklyn working as a dispatcher for the New York City Fire Department. In Breezy Point in Queens, a couple said "I do" despite Superstorm Sandy. NBC's Kate Snow reports. Keane lost cellphone contact with his family around 7 p.m. that night. He got permission to leave his job and raced to a firehouse close to his home. But due to the flooding, no fire trucks were being allowed into the area in southern Queens where Breezy Point is located. When that order lifted, and he was finally able to get on a truck speeding to the area, he spotted the fires lighting up the night sky. James Keane and his fiancee, Kristen Diffendale, hope their wedding will provide respite for their guests. “I didn’t know what was happening down here. I thought it was gone down here,” he said this week, standing amid volunteers and victims near the relief center in their once idyllic community. “He thought I left him,” Diffendale said, looking into his eyes, breaking from the couple’s otherwise jovial banter. “I thought everybody was gone,” Keane said. Their home took in several feet of water in the basement and there was damage to the roof, but the dwelling did not burn. The family, however, spent a frightful night riding out the storm, with Diffendale clutching her grandmother's rosary and in tears. Once Keane, a volunteer firefighter at the Rockaway Point Volunteer Fire Department, learned his family was all right, he joined the effort to battle the blaze. Diffendale and Keane are among the lucky ones in Breezy Point, where Sandy’s hurricane-force winds sparked a six-alarm blaze that burned more than 100 homes to the ground. It is believed that the rest of the 2,100 homes in this close-knit community were also damaged, many due to flooding. The couple was unsure about keeping their post-Thanksgiving wedding date in the aftermath of the disaster. Like many of their friends and neighbors, they have been busy with the relief effort: he, cleaning and gutting flooded basements, and she, hauling supplies to victims. But as the date approached, and more people asked them not to postpone their impending nuptials, the couple decided the community needed a party. “We’ve been planning this wedding for two years and we had to re-plan it in two weeks,” Keane said. 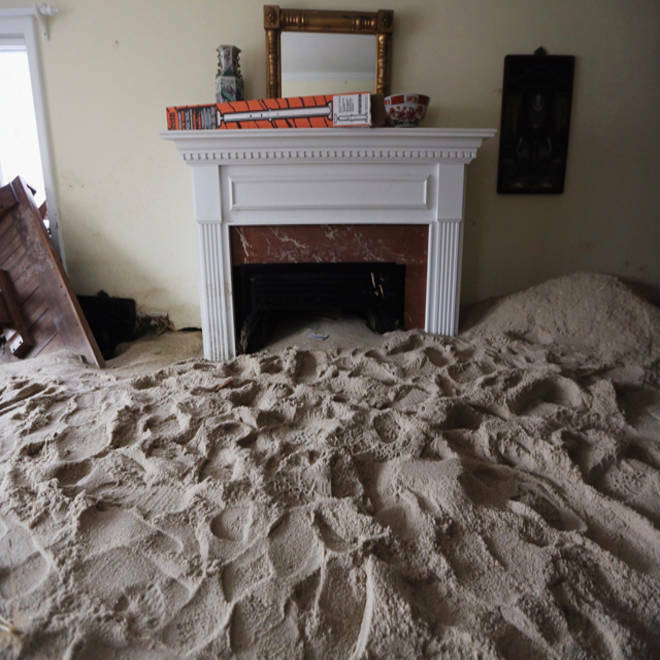 Residents of the Northeast are still picking up the pieces after Superstorm Sandy. The change in plans entailed: moving their wedding to a hall in Long Island and getting permission from leaders at Saint Frances de Sales Parish to still have their marriage recognized by the church; booking rooms at a local hotel for Keane and the groomsmen because the firehouse was out of commission; and arranging for buses to transport many of the 300 guests to the wedding, since so many were forced to relocate. Diffendale said they weren’t “stressing the little stuff anymore,” and her only near-Bridezilla moment came while tracking down the special-made sneakers, which have the wedding date inscribed on them. The mail delivery was interrupted by the storm and because the shoes were in different packages, they ended up in different locations. Diffendale was told the shoes would be delivered Nov. 28, after the wedding, but a shipping agent helped her locate them. The wedding has taken on new meaning for the couple, too. “You thought you had, I don’t know, nothing," Keane said. "I didn’t even know there was even a neighborhood here anymore ... when I came down." Despite the disaster that befell their community, they don’t expect a sullen affair.